State 49 ranks as one of my absolute favorite races and trips of any of them. You wouldn’t think North Dakota would be that much fun, but you would be wrong. Back in April in knocking off Missouri, I ran with the 3:10 official ‘pacer’ for 15 miles and also talked the night before with a running friend Rob (fellow Mother Road finisher) who was the 3:50 pacer. After chatting with them, I decided to try to become an official pacer as something to do in my future running career. After that race, I emailed the head of this particular pacing team (www.marathonpacing.com) and detailed my credentials and I was entered in as a potential pacer. Cool. Two weeks before the Fargo marathon, I emailed the pacing director and told him that i was already signed up for Fargo and would be there, and that I was ‘available’ to pace. He responded that he was ‘all set’ but that I should have my cell phone handy, just in case as he occasionally gets last minute scratches. Three days before the race, as I was packing, I sent him just one more email asking if he would need me. Again he said no, he was fine, but bring my cell phone, so I did. Thursday at 7pm (37 hours before race start, 150 miles down the road) I get a call from him. Sure enough, he had an injury and he asked me how I was feeling. I asked him which pace times he needed. He chuckled and asked me again how I was feeling. I detailed my last few months of training and racing and he then told me that i could have the 3:20 group or the 3:40 group. I was 98% sure I could run a 3:20, but I though for a first time as an official pacer I should go a little slower to focus on being a good pacer and not worrying about hitting 3:20. As a pacer, your job is to run dead even pace, mile in, mile out. 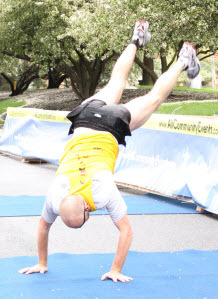 So after some discussion, I became the official 3:40 pacer for the 2011 Fargo Marathon. Then everything changed. First was my lodging as I now had a (free!) place to crash. I had lined up a hotel a few months before, but turns out I clicked on the wrong Super 8 Motel. The one I reserved was 300+ miles away from Fargo. I didn’t figure that out until 4 days before the race. Of course, Fargo being not that big and the marathon/half being huge, there were no reasonably cheap hotels within an hours drive. I decided to get a campsite for the night and just sleep in my car (not too bad) and so I had reserved a site at a State Park 15 min away. Well, within 8 hours of getting that i was calling them back and cancelling that reservation. This was also an official ‘reunion run for the 50 states Marathon people and they even had a meeting with >60 people in attendance. Being in a room full of crazies was kindof fun. This was my first 50 states reunion and it felt special, it being my 49th state. My best friend in Graduate School was Chopper (that’s his nickname, his students even call him that) who is now a Chemistry Professor at Concordia College in Moorehead, MN (just the other side of river from Fargo. We actually ran through the Concordia College campus during the race) I had not seen him in years, so I contacted him a few weeks before the race reminding him I would be in the area. Luckily, he and his family were free for dinner and they fed me some wonderful porkchops. We reminisced, talking about educational philosophy, a little politics, about college professor who abuse their privileges, etc. It was really fun. Chopper and his wife look exactly the same as they did 13 years ago. We all seem to be aging well. After dinner, I headed back to the expo arena (The Fargo Dome, known simply as ‘The Dome’ to the locals) for the official pacer team pre-race meeting. I met the fellow pacers (~11 of them) of which 2 others were first-time-pacers. Predictable stuff, run even pace, even through water stations, talk with your runners, keep them motivated, etc. No real surprises there. Afterwards (about 8:30pm) we all went back to the dorm (where we all got our free rooms) and sat around had some pizza and beer and swapping running stories, including stories of previous pacing gigs. They were all great people and a lot of fun to hang out with. We did get busted because technically, the campus is ‘dry’ and were were drinking (and being loud) but we were let off with a warning. Race morning came like it always did with a shower, mocha and some fruit. about 25 minutes before the start, the pacer team walk to the start line, which took us all of about 30 seconds (the dorms were right next to the start) and we lined up in our approximate locations. With 15 minutes to go until race start, I already had quite the crowd ready to run with me. I chatted with many of them, learning about their running history, goals (besides running 3:40) By the time the race began, I had 60-70 people ready to roll. I gave them a little speech about my responsibilities (and credentials, so they would trust me that I would hit 3:40) and we were off. I tried to keep my group motivated and upbeat, giving words of encouragement, and even the occasional joke. As were were running, more questions came at me about training, my running history, etc. The ensuing conversations (no preaching!) were nice and of course made the miles go by. I hit the first mile marker within 3 seconds of when I supposed to. At each mile I checked my GPS watch to make sure were were ok. At my WORST I was 40 seconds under the total target time I was supposed to be at. I spend most of the race 15-25 seconds under total time target at each mile. I rarely run at 8:23 pace in training so it was a little hard in the beginning, pulling back on purpose. After 5 or so miles I was in my rhythm. The course was ok, I guess. It went in and around lots of different Fargo neighborhoods (I thought at one point the local Real Estate Agents group might be a sponsor) and we saw evidence of recent seasonal flooding. It was so bad that they waited until a few days before the race before they finally decided which course to run. I started with 60-70 people in my entourage, which thinned to 40-50 at mile 5 and 20-25 at mile 10, none of which was a surprise. We met up with (crashed into?) the half marathoners at ~15, which caused congestion, as a that point the half marathoners were almost all walkers. There were 7000 half marathoners, so we were slaloming all over the place for the last 1/3 of the race. Aid stations were rough. Things I saw this day I have never seen on a race course: Irish folk band playing a Foreigner song. A group of accordion players (maybe 12 of them, average age about 75). An aid station (unofficial I think) with 4 people holding boxes of Kleenex (that’s it, no water, just Kleenex). I could not figure that one out. I know I don;t get a runny nose when i race, but who knows. After short congratulations conversations with a few of my runners, I went back, took a quick shower and got back on the road heading home, again stopping at my parents house for the night on the way back. It was a LOOOONG drive, but the memories were so worth the effort. It looks like I will be pacing again in October in Milwaukee. I am looking forward to that! As I near the precious 50 states goal, I needed to go back and re-run 2 states to get official sub-4 finishes so I can knock off 50 sub 4 at the same time I knock off 50. I re-ran Virginia last March, and this was a re-run of Illinois. I attempted the 50 mile ultra back in that first year of running. Horrible sickness meant I had to bail at mile ~34 and get credit for a 50k finish. I have disliked that memory of Illinois for a long time, which is why I waited so long to cancel it out. My wife and I only get the occasional weekend ‘alone’ (known as ‘honeymoon weekends’) and since this race was close, she decided to do the road trip with me.The race was Sunday morning but we left Friday night and overshot Chicago to Madison to spend the night at my parents house. My brother, Michael wad flying into town for a special occasion, the Eagle Scout project of our nephew, Michael James. Me and my two brothers are all Eagle Scouts, so it meant a lot to us to help on on the project of our nephew. The work was on Saturday morning and Mistique and I helped out as long as we could and had to bug out at about 2pm so we could get to packet picket-up before it closed. This being an inaugural race (which I usually try to avoid) the packet pickup was inside a running store. Nice long sleeve technical shirt, no muss no fuss, off to dinner at Applebee’s, of course... I try hard not to get cocky with marathons, but there are some things I still screw up. The week before the race, it had gotten up to 90 degrees in Michigan, so I only glanced at the forecast when I was packing for the race. Oooooops. When I show up to race start with 25-30 mph winds and mid 40’s for temperature in my short sleeve shirt and shorts, I am not doing good. While waiting for the race to start I find a large garbage bag discarded in a trash can. Yeah! I put it on as a poncho (its previous owner had done the same, there were holes in all the right places) and that helped a little. Actually, it helped a lot. Back when I re-ran Virginia, it was so windy (and there I did not have enough clothes either, darnit) that i ran with a plastic bag over my torso for the first 3 miles until I had warmed up enough to remove it. This day it was rainy and windy and damn cold so I kept that darn plastic bag over my upper body until mile 25.8 or so. I looked like a dork, but I did not care. Right before the last stretch (when they might be taking pictures) I finally torn off my plastic bag. I ran across the finish line and Misty and I walked to the car (quickly). I hit the half marathon mark at 1:35 (common) and I slowed down the back half (common) but what was uncommon is how much I dropped off. I was cold, for sure, but I was also tired. As my next big race is the 100 mile national championship in late July, the month of May was slated to be high mileage. For example, in the 14 days immediately previous to this race, I had logged 206 miles. I have been rough after many a race, but this one was pretty bad. Just walking was a struggle and my legs felt like they had just done a 100 miles, not a 26.2 miler. Turns out it was just the cold. By the time Misty and I got back to the hotel room, I had warmed up enough such that I was not too bad. Crappy conditions, bad packing. Ugh. I have no good memories of this darn state. My wife and I only get the occasional weekend ‘alone’ (known as ‘honeymoon weekends’) and since this race was close, she decided to do the road trip with me.The race was Sunday morning but we left Friday night and overshot Chicago to Madison to spend the night at my parents house. My brother, Michael wad flying into town for a special occasion, the Eagle Scout project of our nephew, Michael James. Me and my two brothers are all Eagle Scouts, so it meant a lot to us to help on on the project of our nephew. I try hard not to get cocky with marathons, but there are some things I still screw up. The week before the race, it had gotten up to 90 degrees in Michigan, so I only glanced at the forecast when I was packing for the race. Oooooops. When I show up to race start with 25-30 mph winds and mid 40’s for temperature in my short sleeve shirt and shorts, I am not doing good. While waiting for the race to start I find a large garbage bag discarded in a trash can. Yeah! I put it on as a poncho (its previous owner had done the same, there were holes in all the right places) and that helped a little. Actually, it helped a lot. Back when I re-ran Virginia, it was so windy (and there I did not have enough clothes either, darnit) that i ran with a plastic bag over my torso for the first 3 miles until I had warmed up enough to remove it. This day it was rainy and windy and damn cold so I kept that darn plastic bag over my upper body until mile 25.8 or so. I looked like a dork, but I did not care. Right before the last stretch (when they might be taking pictures) I finally torn off my plastic bag. I ran across the finish line and Misty and I walked to the car (quickly). I hit the half marathon mark at 1:35 (common) and I slowed down the back half (common) but what was uncommon is how much I dropped off. I was cold, for sure, but I was also tired. As my next big race is the 100 mile national championship in late July, the month of May was slated to be high mileage. For example, in the 14 days immediately previous to this race, I had logged 206 miles. I have been rough after many a race, but this one was pretty bad. Just walking was a struggle and my legs felt like they had just done a 100 miles, not a 26.2 miler. Turns out it was just the cold. By the time Misty and I got back to the hotel room, I had warmed up enough such that I was not too bad. Crappy conditions, bad packing. Ugh. I have no good memories of this darn state.